The Cubs' offense awoke late in NLDS Game 3 to produce runs in both the seventh and eighth innings. That was enough to edge the Nationals, who have been weighed down by a lifeless offense and a bullpen that spoiled Monday's game. The Cubs are one out away from a third straight NLCS. In a tense, back-and-forth game with the Nationals, Chicago fell behind but came back late against Washington’s bullpen, winning Game 3, 2–1, at Wrigley Field to grab a 2–1 series lead. For both Joe Maddon and Dusty Baker, the choice must have felt like a no-win situation. Each team’s starter—Jose Quintana for Chicago, Max Scherzer for Washington—was cruising: Through five innings of play, neither side had been able to push across a run, and the Cubs hadn’t even managed a hit. But as pitch counts built, both Maddon and Baker knew that a time was coming to make a decision: How much longer could they let their pitchers go? For Maddon, the breaking point was the top of the sixth, when Daniel Murphy lofted a flyball to left for what should have been the final out of the frame. But as the ball drifted toward the side wall, Kyle Schwarber raced to keep up. Whether he lost track of it or misjudged it off the bat, who knows, but at the last moment, he threw his glove out, trying in vain to reach a ball that, by Statcast’s calculations, had a catch probability of 82%. The ball clanked off his glove and bounced off the wall, with Schwarber kicking it as he tried to pick it up. By the time he’d fired his gaffe back into the infield, Murphy stood on third, and Maddon was on his way out to the mound. Whether Maddon was too quick with Quintana is up for debate. The lefty was at 96 pitches after Murphy’s Schwarber-aided triple; righty Ryan Zimmerman was up; and righthander Pedro Strop was ready to go. But given how easily Quintana had carved up the Nationals’ lineup—just two hits and a walk allowed against seven strikeouts—why not let him finish the inning? As it was, Maddon’s move backfired: On Strop’s third pitch of the game, Zimmerman took a fastball and rocketed it into the right-center gap to score Murphy and make it 1–0 Nationals. That looked like it might be enough for Scherzer, who had ripped through Chicago’s order with ease. But after striking out Willson Contreras to open the seventh, Scherzer finally gave up his first hit, a Ben Zobrist double into the left-center gap. Baker ambled to the mound, seemingly to hear Scherzer make his case to remain in the game, but before long, Baker's left arm went up. Out of the bullpen came southpaw Sammy Solis to face Schwarber; out went Scherzer. Like Maddon’s call, this one was plenty questionable. On the one hand, Scherzer was literally unhittable until he left a fastball middle-in to Zobrist, and despite being at 98 pitches, the righty blows by 100 on a regular basis. On the other, this was his first appearance in 10 days, when he left his final regular-season turn early due to a strained hamstring that had cost him the start in Games 1 and 2. Whatever Scherzer and catcher Matt Wieters said, Baker erred on the side of caution. And like Maddon, he had cause to regret it: Facing pinch-hitter Albert Almora Jr., Solis gave up a single to left to score Zobrist and tie the game at one. Perhaps more than any postseason prior, managers this October have had to weigh constantly the virtues of sticking with a starter versus going to a bullpen, often far earlier than convention would call for. Few if any pitchers are being allowed a third look at a lineup, and with bullpens as dominant as they are, it’s easy to understand the calculus of Maddon and Baker. Why risk the starter blowing it when a fresh reliever could save it? But in both cases, there’s an argument to be made for a longer leash, particularly for starters as effective and seasoned as Quintana and Scherzer (the latter of whom is playoff tested and approved). And in Baker’s scenario, the choice to go with a lesser reliever in Solis instead of one of his better bullpen options is tougher to defend. Both teams escaped those innings without further damage, but the Nationals’ bullpen blinked first. Righty Brandon Kintzler, who cleaned up Solis’ mess in the seventh, created one of his own in the eighth by walking pinch-hitter Tommy La Stella to open the frame. A bunt moved him to second, and Kintzler looked to have the situation under control after striking out Kris Bryant. But with Anthony Rizzo up, Baker again went to his bullpen, this time for lefty specialist Oliver Perez. The Mexican veteran got the contact he wanted, inducing a first-pitch popup to center, but with the outfield playing deep, neither Michael Taylor nor Jayson Werth was able to get to Rizzo’s bloop in time. La Stella crossed home plate as the ball somehow found grass to give the Cubs a 2–1 lead, and from there, closer Wade Davis finished it with a perfect ninth to give Chicago the series lead. The hope for Washington after Saturday night’s shocking Game 2 win, in which the Nationals erupted for five runs in the eighth to come back and even the series, was that it would be a sign of things to come for the offense. The lineup’s effort was positively putrid in a Game 1 shutout loss and through the first seven innings of Game 2, but after the middle of the order battered relievers Carl Edwards Jr. and Mike Montgomery in the latter, manager Dusty Baker couldn’t help but feel relief with regards to his hitters. But that momentum didn’t carry over to Game 3. Facing Quintana, Strop, Edwards (who was the goat in Game 2 but rebounded with a scoreless eighth on Monday) and Davis, the Nationals managed only one run on three hits. For the series, they’ve been limited to seven runs in 26 innings—five of those coming in one frame—and only three home runs. After Zimmerman’s RBI double on Monday, the next 10 Nationals went down in order. The concern for Baker has to start at the top of the lineup, where Trea Turner has been held completely in check: The 24-year-old shortstop is still hitless in the series after going 0-for-12 on Monday. That’s had a stultifying effect on the rest of the lineup: Turner’s speed is a crucial component of Washington’s offense, allowing him to turn walks and singles into doubles through stolen bases and put himself in scoring position for the thumpers. But Turner’s not alone. Bryce Harper and Zimmerman were the heroes of Saturday night, but they combined to go 1-for-8 on Monday. Aside from his solo homer to start Game 2, Anthony Rendon hasn’t done much. Neither has Murphy, who’s contributed just two singles and a walk in 12 trips to the plate. The Nationals simply can’t win with that group all slumping at once. Unfortunately for Baker, there isn’t much he can do realistically to get things going. He isn’t the type to shuffle lineups for the sake of it, and there’s no hot bat to move up in the order anyway. The bench doesn’t offer any better options either. His only hope is that his team can snap out of it once more—and soon. As far as pitching matchups go, Tuesday’s Game 4 tilt looks a touch lopsided. Starting for the Cubs will be Jake Arrieta, who struggled through an injury-interrupted 2016 season but is still a former Cy Young. Roark, meanwhile, was durable yet mostly unexceptional as Washington’s fourth starter, contributing a 4.67 ERA and 95 ERA+ in 181 1/3 innings. There is no other real option for the Nationals, though. 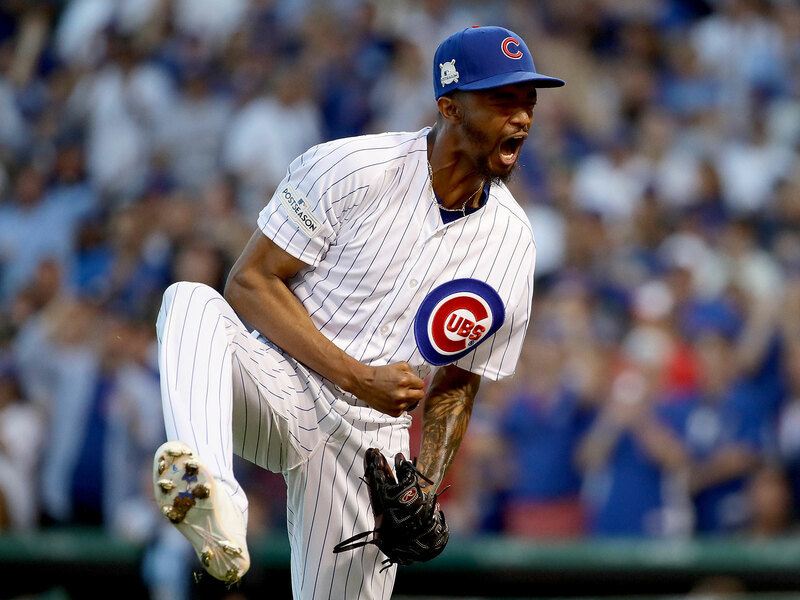 The team already ruled out using Stephen Strasburg on short rest, something he’s never done, and fifth starter Edwin Jackson would be no one’s choice for a potential elimination game. And while the bullpen will be emptied at the first sign of trouble, don’t expect the conservative Baker to start throwing out starters in the middle innings—perhaps Game 2 starter Gio Gonzalez in an emergency, but that’s it. Arrieta isn’t the same pitcher he was in 2015, and like Scherzer, he was pushed back in this series because of injury, so he may not be at 100%. But the Nationals’ task will be as tough as any imaginable, to save the season with a fourth starter and a slumping offense on the road against the defending world champions.